Find the best accommodation deals for Casa Vista del Mar Inn right here! Rates: Starting at $95 per night with a 2-night minimum stay during off season or $595 weekly for its studio; $110 per night with 3-night minimum stay apartment or $693 weekly for the single bedroom; for stays less than a week, add $35 and $45 for cleaning fee for the studio and single bedroom apartment, respectively. Add 9% for small inn tax. Acclaimed as representative of the Puerto Rican paradise resort getaway, Casa Vista del Mar is more a guesthouse inn than a hotel. Quiet and peaceful, the inn is nestled right in the lush hilly tropics of the city that is known for its world famous Rincón beach noted as the surfing capital of the Caribbean. The hotel overlooks and provides an impressive panoramic ocean view from a studio or single bedroom apartment. The coastal city of Rincón sits on the west coast of Puerto Rico. It is home to the renowned El Faro lighthouse which is one of just two whale watching observatory parks that also affords a breathtaking view of the Caribbean sea. Then you have the Rio Camuy Cave Park, Arecibo’s gigantic radio observatory telescope, aromatic coffee plantations, the majestic Phosphorescent Bay, and the El Yunque rain forest. And all these stunning places are just a short ride away from the Casa Vista del Mar Inn, apart from being just a 5-minute drive to the Rincon beach, and 3 minutes from the Corcega Beach and downtown Rincon. In addition, it is just a walking distance away from fine dining restaurants and boutique shops. Depending on the time of year, you get treated to surfing competitions, marathons and music festivals. In spite of its access to modern comforts, Rincón has retained much of its rustic rural charm. 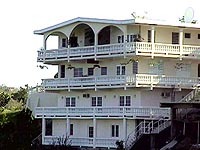 For tourists who want the peace and quite of a rural setting, the Casa Vista del Mar is perfect. While you have easy access to many of the city’s bustle, it has no pool for noisy kids, and no bar for potential drunks. It’s a true relaxing retreat, not a party central. 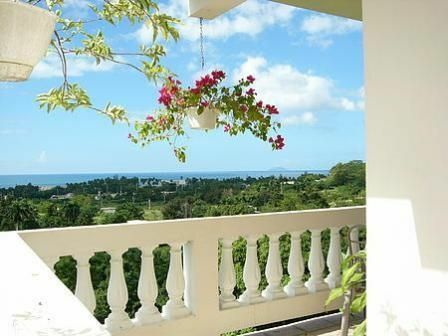 The 4-storey Casa Vista del Mar has 5 comfortably appointed and tastefully decorated apartments. Each has an ocean view terrace with outdoor furniture, air conditioning, kitchenettes, satellite cable/TV/DVD player, queen size beds and complimentary broadband WiFi internet access. The kitchenette is complete with microwave, coffee maker, toaster, and blender as well as a gas-fired BBE grill. You also get to launder your own clothes with a washer and dryer. Casa Vista del Mar has 3 studios and 2 single bedroom apartments and along with individualized aesthetics, the only distinction is the number of guests that can be accommodated in either. The studio can accommodate up to 2 guests and is perfect for couples while the single bed apartment can accommodate up to 4 guests and is perfect of a family or group of friends. Parking is free for guests.